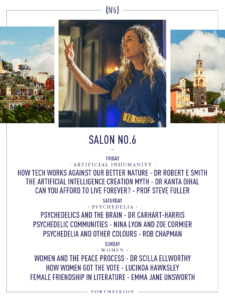 We’re excited to announce that Salon No.6 will be returning again this year to host and curate three themed nights of talk and debate on Artifical Inhumanity, Psychedelia and Women. On Friday we have Dr Robert E. Smith, Dr Kanta Dihal and Professor Steve Fuller discussing Artifical Inhumanity, a topic we all know as AI progresses but something we know little about. Saturday will see us delve into all things Psychedelia, taking us on a journey of discovery and expansion of the human mind with Dr Carhart-Harris, Nina Lyon & Zoe Cormier and Rob Chapman. Sunday will finish with our final theme, Women. Lead by Nobel Peace Prize Nominee, Dr Scilla Elworthy PhD, Activist, author, broadcaster and descendant of Charles Dickens, Lucinda Hawksley and seminal author Emma Jane Unsworth, we can’t wait for you to join us.